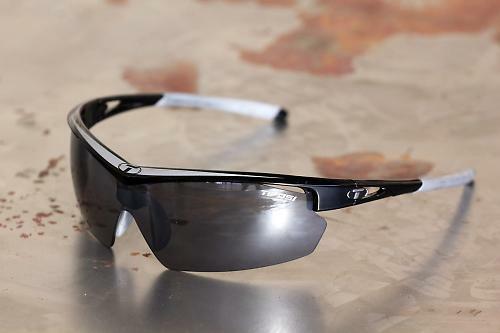 The Tifosi Talos glasses are designed with a full wrap around shape so they offer a full field of vision with no frames in the way on either side. They also provide full protection from the elements, which I found particularly useful during the last week of testing, which had 30mph winds and even storms while I was wearing them. I have used a variety of wraparounds, from the very cheap and cheerful when I first started riding to the very expensive and good quality. Despite only being £60 compared to the £120 I have paid for the most expensive pair, the Talos glasses compare well because of their high quality construction paired with decent ventilation and comfort. As these are wraparound glasses, the logical place to start is with the lenses. They come with three sets: dark, orange and clear. Each have their use in different conditions: dark for sunlight; clear for low light; and orange for all round. I found that the lenses were of a very good quality. Tough too; they survived no marks at all despite being accidentally put in a jersey pocket with my keys. Each colour works well for its purpose, providing clear and fairly well ventilated performance. There is a slight warping that you can see in the lenses, but nothing that would hinder your enjoyment of them. In fact with full wraparounds like these, I am yet to find a pair at this price range that don't have some small amount of distortion, simply because of the length of lens. Changing the lenses is also very simple, all you do is pull the lens down while holding the frame. Adding in new lenses is equally simple, just slotting the tabs in on either side and pushing up until you hear a click. For an extra 10 pounds you can get The Talos with a set of mirror finish Clarion hydrophobic lenses which are supposed to repel water and sweat. Fogging wasn't a problem, though they got a bit misty at the top of the the lenses when waiting at traffic lights in the cold and wet after a long climb. Throughout the test this never really impaired my vision and thanks to decent ventilation would disappear almost instantaneously when setting off again. The glasses are well made, with strong frames and nice hidden hinges. They offer a good degree of stiffness without hindering movement. I think that they also look fairly good. I personally prefer the look of full framed glasses or the slightly more angular options from companies like Oakley, but compared to many other wraparounds that you may see in the peloton, these look nice. They sit well on your face, with decent grip on the sides of your head and good anti-slip on your ears and nose. When wearing glasses during a ride these are some of the most important aspects simply because it is where the bulk of the weight of the glasses go. Coming in at only 30g, they aren't heavy at all. Weight isn't everything with glasses though. I have had glasses of similar weight that could become uncomfortable, with these it was not the case and they managed to maintain relative comfort throughout. The ventilation was good and allowed for a flow of air around the ears and nose, which keeps them comfortable on your head for hours. Overall, I was impressed with these glasses. They have a good field of vision, decent ventilation and are comfortable on your head even after several hours in the saddle. At £60 they are very good value and are comparable with more expensive brands. For protection of the eyes from sun and dirt whilst riding. Like any glasses. They work well for what they are required to do. The lenses work well in terms of protecting against sunlight and their high quality construction and wrap around design meant that no dust or dirt got through. Very good construction, only fault I could find is the very slight warp in the lens, even this was only noticeable after I started looking for it. Works well, comfortable for long periods of riding whilst also good for protection. Would think that these would last for a long time. Lenses are hard to scratch, frame is sturdy and hinges seem to be high quality, not much else could go wrong with them. 30g for a set of glasses is fairly good. Ventilation and effective anti slip rubberised arms and nose piece meant that they were comfortable throughout the testing period. Very good value when compared to the elite glasses that can cost £100 more. They worked very well. The level of fogging that occurred was acceptable as they never fogged enough to impair my vision and cleared quickly afterwards, they allow for a good range of vision and sit comfortably on your head. I was impressed with all lenses when used for their purpose. They effectively protect against sun, dirt and air when riding whilst also sitting comfortably on your head. The vents within them also meant that fogging only really occurred occasionally and never really impaired my vision. The slight warp on the glasses and small amount of fogging are the only faults I could find. Impressive glasses that cyclists would not be disappointed with at their £60 price mark.
" I need your clothes, your boots and your motorcycle"
"...and some factor 50 for my forehead"
Is the nosepiece adjustable? I find a lot of glasses don't sit right for me (the top of my ears must be high up compared to the bridge of my nose) and they end up tipping forwards or just too low down.